Place the heavy cream and chopped orange peel in a small saucepan over medium heat. When the cream begins to simmer, remove from heat, cover, and let steep for at least 30 minutes. Remove the orange peel from the cream and reheat the cream over medium heat until it just comes to a boil. Add the chopped chocolate, and remove the saucepan from the heat. Stir the mixture with a rubber spatula until the chocolate is completely melted and smooth. Stir in the champagne until completely combined with the chocolate (it will separate at first, but keep stirring - it eventually comes together). Transfer the mixture to a small bowl and place plastic wrap over top, pressing it against the surface of the ganache. Refrigerate overnight. When ready to roll the truffles, line a baking sheet with parchment paper and set aside. Use a small cookie scoop or a melon baller to scoop out heaping teaspoons of the ganache. Quickly roll in the palm of your hands to form a ball. Place on the baking sheet. Repeat until you have used up all of the ganache. If you are finishing the truffles with sparkling sugar, place a few tablespoons of white sanding sugar in a small bowl and roll the truffles in the bowl to coat with the sugar. Return them to the baking sheet. Refrigerate to set, at least 30 minutes. 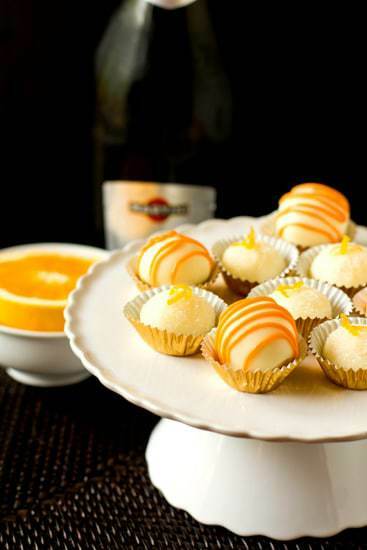 If using the white chocolate coating, refrigerate the truffles for at least 1 hour, otherwise they will begin to melt when dipped in the chocolate. When they're ready, microwave the white chocolate and vegetable shortening on 50% power for 1 minute. Stir, and then continue to microwave on 50% power for 30 seconds, stirring after each, until completely melted and smooth. When ready, drop 1 truffle into the melted chocolate and, using a fork and working quickly, turn it over so it is completely coated and then lift it out, letting any excess chocolate drip off. Return to the baking sheet and repeat with remaining truffles. Refrigerate to set, at least 30 minutes. If you wish, you can drizzle with orange candy melts - melt according to the package directions and then use a Wilton #2 decorating tip to pipe decorations on top. Let set for at least 15 minutes. Store any leftover truffles in the refrigerator until you're ready to serve them. Note: It's important to use good-quality white chocolate here for the smoothest and best-tasting truffles. I always prefer using Lindt white chocolate; just be sure not to use white chocolate chips - they will not melt down well.